"Act F.A.S.T." is the message from Mayo General Hospital who recently hosted two successful public information days on stroke, in association with local Heart & Stroke Charity, Croí. 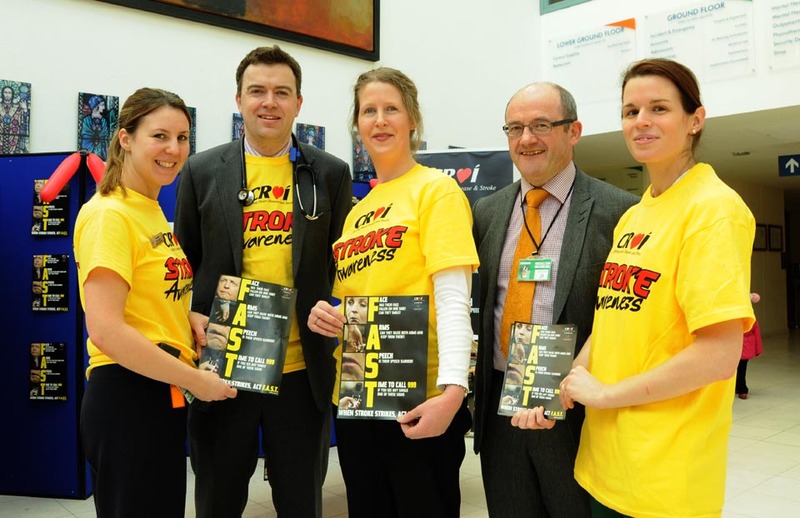 Several hundred members of the general public were greeted in the main foyer of the hospital by healthcare professionals specialised in stroke, who were promoting the key messages of the Stroke F.A.S.T. campaign. These information days, which took place on the 11th and 14th of March, served to raise public awareness on how to recognise a stroke and highlighted the urgent need to act F.A.S.T. and call 999 immediately if somebody is suspected of having a stroke. A joint initiative between the HSE in Mayo and local Heart & Stroke Charity, Croí has seen the month of March designated as Mayo Stroke Awareness Month. This month-long campaign, which includes a number of public information events, aims to raise awareness about stroke in Mayo, and communicate key messages on stroke recognition and prevention. Clinical Nurse Specialist in Stroke Care in Mayo General Hospital, Niamh Murtagh explains why every member of the public should know the Stroke F.A.S.T. message "Stroke is a medical emergency. It destroys two million brain cells every minute so Time Is Brain. If you suspect that somebody is having a stroke, call 999 immediately". F - Face - Has the face fallen on one side? Can they smile? A - Arms - Can they raise both arms and keep them there? S - Speech - Is their speech slurred? T - Time - Time to call 999 if you see any single one of these signs. Promoting the Stroke F.A.S.T. campaign at Mayo General Hospital are left to right, Niamh Murtagh, Stroke Care Clinical Nurse Specialist, Dr. Tom Lee, Consultant Physician, Mayo General Hospital, Ailish Houlihan, Croí Nurse, Dr. Tom O’Malley, Consultant Physician, Sinead Duddy, Occupational Therapist, Mayo General Hospital. Promoting the Stroke F.A.S.T. 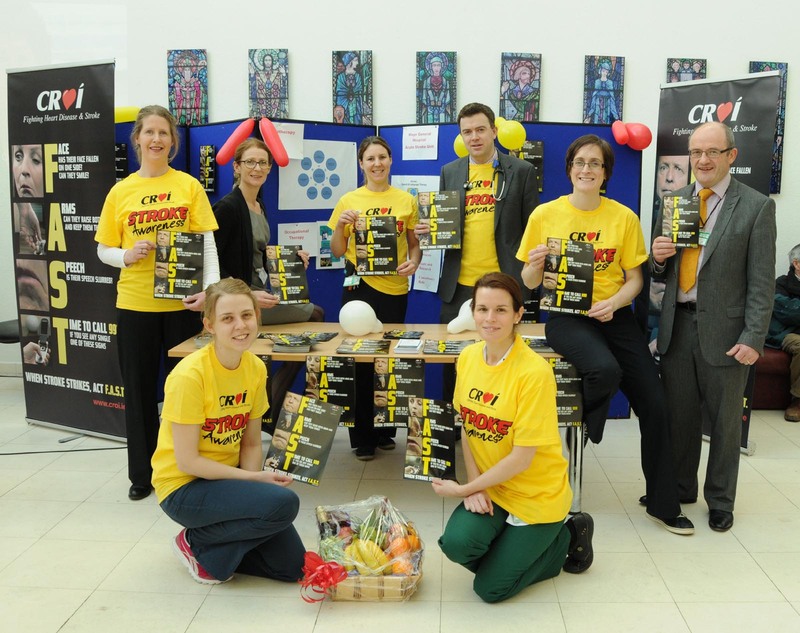 campaign at Mayo General Hospital, are left to right, back; Ailish Houlihan, Croí Nurse, Catherine Donohoe, Director of Nursing, Niamh Murtagh, Stroke Care Clinical Nurse Specialist, Dr.Tom Lee, Consultant Physician, Mary McDonnell, Physiotherapist, Dr.Tom O’Malley, Consultant Physician. Front left to right, Alanna Ni Mhíocháin, Speech and Language Therapist, Sinead Duddy, Occupational Therapist, Mayo General Hospital.